Mrs. Toy and I decided to treat ourselves, along with her parents and brothers, to a Giants game at Pacific Bell Park in San Francisco. This was only the second time in my life that I had been to a major league baseball game. The first was in 1965. 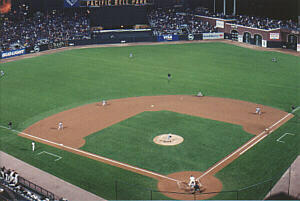 I was in first grade when my dad took me to Candlestick Park to see the Giant's and Dodgers. 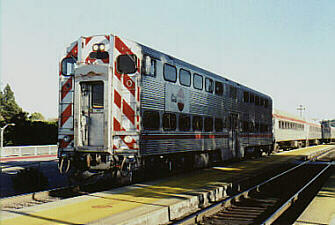 This trip was the first ride on Caltrain for any of us. We purchased game tickets on-line just a few days before the attack on New York and the Pentagon. This was the Giant's second game after play resumed. I was excited when we ordered the tickets, but the events of the following week made me a feel very uneasy about going to a large public facility. But everything turned out just fine that evening, and it helped us take our minds off of the horror for awhile. We met the in-laws at their home in San Mateo. Around 5:00pm they drove us to the Hillsdale train station and we easily found a place to park. . The ticket window was closed so we had a brief moment of "what do we do?" A man there, one of the regular riders, advised us we could purchase our tickets on the train. We walked up to the platform and found two ticket machines. These allegedly accepted coins, bills and credit cards. So we tried one out. The menu was pretty easy to follow, but when it came time for payment it wouldn't process a credit card. We tried two of mine and my mother-in-law tried hers, all with the same result. We were about to try cash when the train pulled up. The train was in push mode. The locomotive was at the rear. 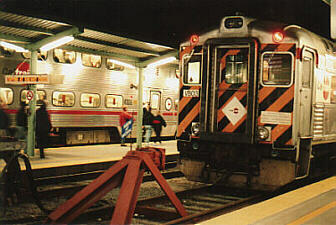 The lead car contained a control cab for the engineer. 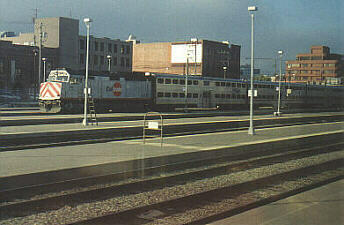 The lead car was one of the bi-level cars, while the rest were single level. We boarded a single level car. The first thing I noticed about the car was the smell. It smelled like a real train. It was just like I remembered from my trips on the Coast Starlight back in the '70s, when they were still using the old streamliners. But the similarities to any Amtrak train ended there. The interior was more like a transit bus. The seats were bench type, with vinyl upholstery. 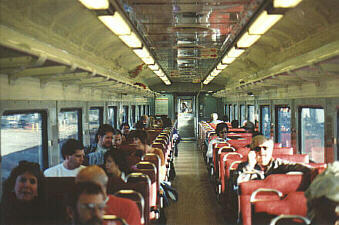 Half of the seats faced forwards, half rearwards. When the train changes direction half of the seats will always face forwards. This train was noisier and rode more roughly than any Amtrak train. Also lacking was a rest room. Although the car was obviously quite old, I was impressed with its cleanliness. I didn't see a speck of dirt anywhere inside. The outside was another matter, for the windows were pretty dirty. For a 30 minute ride it was a perfectly adequate, and reasonably comfortable, conveyance. It was a good 10 minutes before the attendant, a charming young lady, came by to sell us our tickets. We paid for a round trip as advised by the signs back at the station. Round trip fare was $5.50 per person. The fare is based on a zone system. The more zones you pass through the more you pay. We passed through two zones. Unlike on Amtrak trains, Caltrain riders are not particularly social. Everyone pretty much kept to themselves. I thought about walking around the train, but a sign on the door to the next car prohibited anyone from passing between cars while the train was moving. However, the attendant and conductor did it all the time. No train trip is complete without a few tunnels. We ran through four holes in the hills as we entered The City. 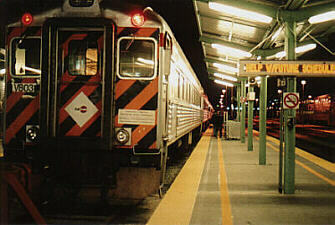 As we approached the station I photographed a full bi-level train stopped at the far platform. The end of the line put us just one block from Pac Bell Park. Probably closer to the park than we could have parked. We exited the train through the bi-level car at the front. The ballpark itself was impressive. It was modern and very clean. I don't remember seeing a single piece of trash on the ground anywhere. The rest rooms were as clean at the end of the game as when we first arrived. The sound system was clear and conveyed music as well as a good home stereo system. We were sheltered from the prevailing winds by the structure itself. We didn't begin to feel the slightest chill until about 10:30pm. The seats even had cupholders. In all it was a first-class operation. We had seats almost at the top, right behind home plate. From there we had a terrific view of the action, as well as the bay beyond. We settled in and enjoyed the game, the smells, the food, the view, and everything. It was very relaxing and the time flew by. The Giants were playing Houston. Our home team lost 10-3. The Astros got their first four runs in the first five minutes. We didn't get our three until the bottom of the 9th. Fooey. At the conclusion of the game we went straight back to the station. Two trains were waiting to take the fans back home. One was a local, the other an express. We had to take the local. This train was all single level cars, and it was at least 10 cars long, maybe more. This train was a little quieter than the first, but the PA system was turned up too loud, so much so that my father in law had his hands over his ears much of the trip. This car was also very clean, and the attendant was smiling constantly as he walked back and forth. Overall it was a reasonably fun train ride, but not as comfortable as Amtrak, or even BART for that matter. 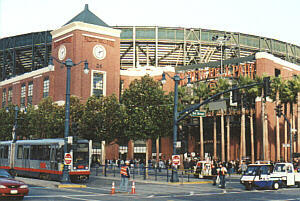 But for Giant's fans on the SF Peninsula it is the only way to go.